Debug Optimo is an alternative formulation to users who want less Neem Oil (FGOM) in their formulation. Lower FGOM content lowers the freezing point and also less phytotoxicity at very high temperatures above 90 degrees. DEBUG OPTIMO is a formulation containing 15% Fats and Glyceredic oils, Margosa (containing several triterpenoids & neem oil), 0.70% Azadirachtin and 28% synergist. Unlike the other neem products available in the market, Debug Optimo has Azadirachtin, several liminoids, oil of neem and a synergist. It has better broad spectrum capability, better stability against UV degradation and decreases the likelihood of insects developing resistance. 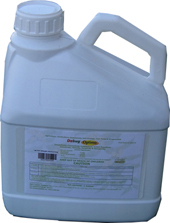 DEBUG OPTIMO is a board spectrum insecticide effective on a wide range of vegetable crops and several insects, nematodes, mites and fungal diseases. Debug Optimo is a formulation with 0.7% Azadirachtin and 15% Neem Oil. For use in colder temperatures.